A 73-year-old man was admitted to our department following the incidental finding of a focal liver mass in computed tomography (CT) scan. The patient reported no symptoms, other than upper abdominal discomfort. He had no significant medical history and no remarkable family history. Physical examination did not show any abnormalities. Findings for all clinical laboratory tests conducted at our institution, including those for the carcinoembryonic antigen and α-fetoprotein tumor markers, were within the normal range. However, he tested positive for serum markers of hepatitis B virus (HBV) infection (i.e., antigens and antibodies to hepatitis B surface protein, hepatitis B e protein, and hepatitis B core protein), with a viral load of 1.99 × 103 IU/mL, but was negative for hepatitis C virus and human immunodeficiency virus. The mass in the left hepatic lobe (segment II) was detected on plain CT as a hypodense lesion. Contrast-enhanced CT and gadopentetate dimeglumine-enhanced magnetic resonance imaging (MRI) were performed for precise imagistic evaluation. The CT revealed the mass as a faint enhancement during the arterial phase. However, in the MRI, the lesion appeared to have low intensity on T1-weighted imaging, slightly high intensity on T2-weighted imaging, and intense restriction of diffusion on diffusion-weighted imaging. Based on the clinical and radiologic findings, the lesion was diagnosed as malignant. 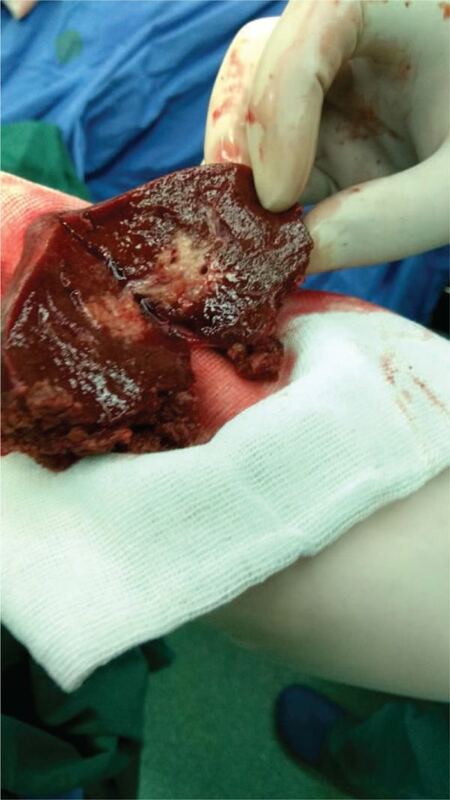 The patient consented to undergo a laparoscopic left lateral segment liver resection (segments II–III). The gross finding following the resection was a white-colored, 1.8 cm, nodular tumor mass. Histologic analysis of the resected tissue revealed a large number of atypical lymphocytes diffusely infiltrating the hepatic lobule and the portal area and lymphoepithelial lesions with small to medium-sized lymphocytes on some of the bile capillaries. Immunohistochemical analysis showed that the lymphocytes were positive for CD20, Ki67, PAX-5, BCL-2, CD79a, CD21, and CD23, but negative for Bcl-6, CD3, CD5, CD10, CD43, CD56, CD138, MUM1, and cyclin D1. 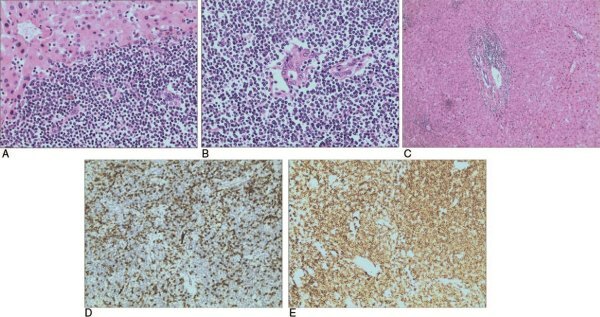 Based on the above-mentioned pathologic features, the patient was diagnosed with primary hepatic MALT lymphoma, specifically a low-grade malignant extranodal marginal zone B-cell lymphoma. The patient refused any additional treatment after the surgery and remained disease free throughout the 6 months of follow-up.